Our Motorcycle Safety “Rider ID” is a two part system that allows you to carry your essential I.D, medical details and a record of contacts for emergency services to call should you be involved in an accident. This information ensures you receive appropriate & fast medical assistance and also allows your loved ones / family to be quickly contacted and notified of your situation. 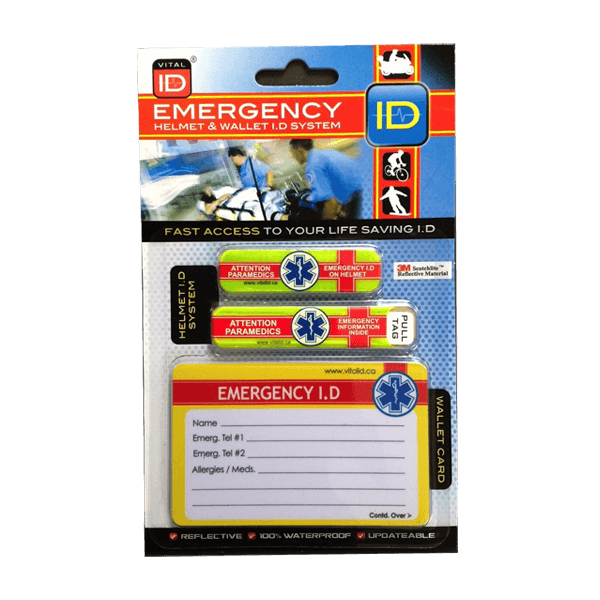 Our Safety “Rider ID” is a two part system that allows you to carry your essential I.D, medical details and a record of contacts for emergency services to call should you be involved in an accident. This information ensures you receive appropriate & fast medical assistance and also allows your loved ones / family to be quickly contacted and notified of your situation. Component 1: Our “HELMET ID” System – Reflective ID sleeve and warning decal is fixed to the exterior of your helmet. 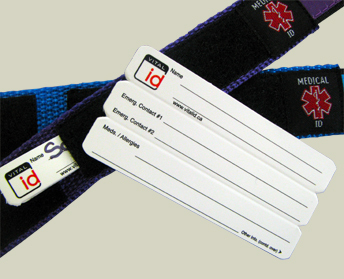 The waterproof ID card is stored within the ID pocket and is easily accessed by the paramedics without removing the riders helmet. The additional warning decal is fixed on the opposite side of the helmet to the “ID sleeve”. Both parts of our Helmet ID are highly reflective, being made using Scotchlite reflective material. Component 2: The “WALLET CARD” – The system is supplied with a durable “wallet card” that like the helmet fixed ID sleeve, stores a note of your emergency information as a secondary back up to the helmet ID. Both sides of the card can be used to note down your information. This wallet card also serves it’s emergency purpose when your “off the bike” & in the car as it’s always securely stored in your wallet. 3) Details of your personal doctor and their contact info. 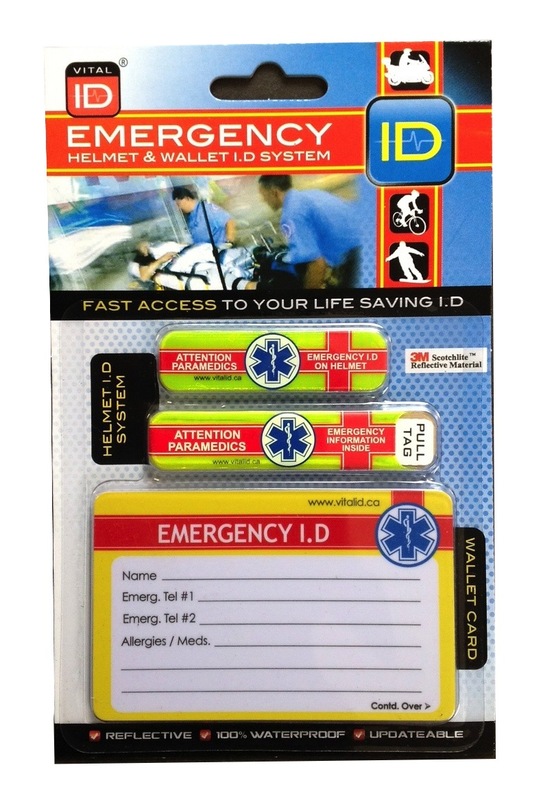 5) Other info – both the Helmet ID & Wallet card allow you to store any additional information you would like to add and you feel would be useful to attending paramedics / first responders. 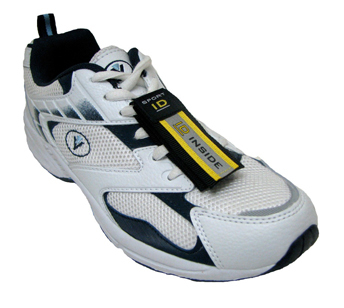 100% WATERPROOF – Made from fully waterproof materials, designed to be impervious to wind & rain. Our Safety “Rider ID” system is a “just in case” solution that we you hope you never need. Accidents do happen and our system could just save your life! 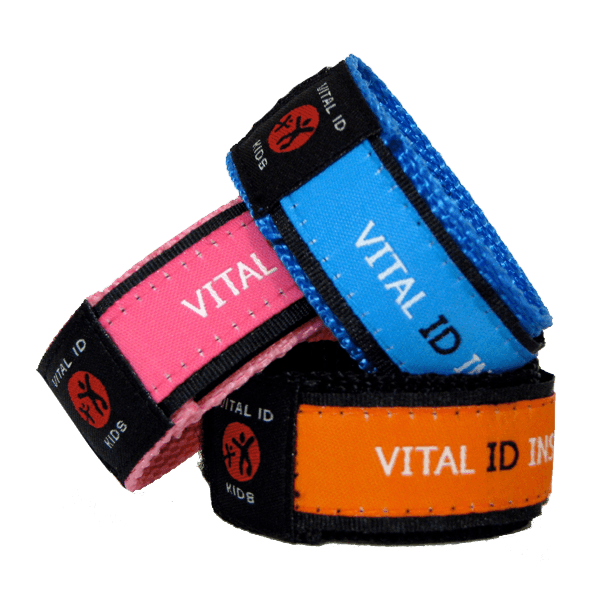 We purchased 300 of the Vital ID “Cycle” id’s for our members in the Pacific Northwest Vintage Motocross Club after one of our members had a health issue at a race. While not mandatory our local EMT’s strongly encourage all out racers to use this system on their helmets. Glad to see most of our members using them. 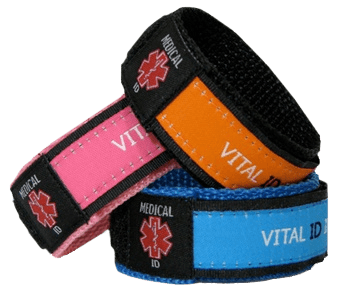 Having quick access to vital medical information at the time of the incident is so simple with the Vital ID system. I am a retired U.K. Police motorcyclist and throughout my career from the 1970’s through to the early noughties, attended a huge number of collisions where motorcyclists and or cyclists were involved. It was very frustrating to have an injured person(s) laying at the scene of a collision and unable to talk to us first responders, thus not being able to give us vital medical info. On many occasions, a search of their clothing would not reveal any medical information that could have helped in effectively dealing with these injured people. Sadly some injured persons died as we were not able to provide correct medical treatment and it was then very difficult to have to deal with the distraught relatives. I saw several schemes come and go as more and more people tried to put to the public eye the value of life-saving medical information. As Police Motorcyclists, we would attach sticky labels or tape to our crash helmets which gave medical persons vital information. This was a very effective way of showing the importance of having vital info to hand. Then I saw http://www.vitaId.com advertising in the British Motorcycle press and immediately bought their helmet and wallet medical cards which stored vital medical info in long-lasting and waterproof sticky “miniature envelopes”. These were highly sticky and highly eye catchingly coloured so as not to be missed by paramedics and the like. Where a rider was rendered unconscious their medical ID could be accessed or even passed to medics attending the scene so they could send more appropriately equipped vehicles and personnel. This was a significant leap forward in saving motorcyclist and pedal cyclists lives. I can vouch from personal experience that these sticky miniature envelopes stay on my crash helmets for more than the 5-year life of the helmet. I can say these devices are worth carrying as it is likely to be the most sensibly purchased articles you ever buy for your bike that will save your life if you were unfortunate enough to be involved in a collision.